Our highly-trained team of oral health care professionals are able to offer a wide range of teeth replacement options. Just one of these services includes our dental bridges, which (just like crowns and veneers) can be made in-house in just one appointment using our advanced CEREC machine. A bridge is essentially a false tooth or teeth (crowns) that can be affixed to remaining healthy teeth, or to a dental implant. They literally ‘bridge’ the gap created by one or more missing teeth, therefore obtaining their name. Dental bridges help to support the health of your existing teeth, whilst maintaining their function and bite. Traditional fixed dental bridge: this involves creating a crown for the tooth or implant on either side of the missing tooth, with a pontic (false tooth) in between. Cantilever bridge: which is fixed to a crown on only one side. Although this restoration is slightly weaker than a traditional bridge, it means fewer teeth have to be treated. Resin-bonded bridge: this type of bridge can only be used on the front teeth, as it is secured with metal ‘wings’ that bond securely to the teeth on either side. 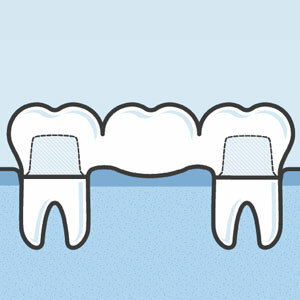 Implant-supported bridge: this is used in cases when many teeth are missing. The implants are imbedded into the bone of the jaw and a bridge is attached between them. Implant-supported bridges can be fitted even if you have no teeth at all, and is a longer-lasting, more secure solution than dentures. To find out more about our high-quality, same-day bridges using our advanced CEREC machine, please call (03) 9568 8911 today. We look forward to helping you gain a confident, healthier, and more functional smile!